As mentioned in a previous post, a completely free online course starts on March 14th so sign up now. 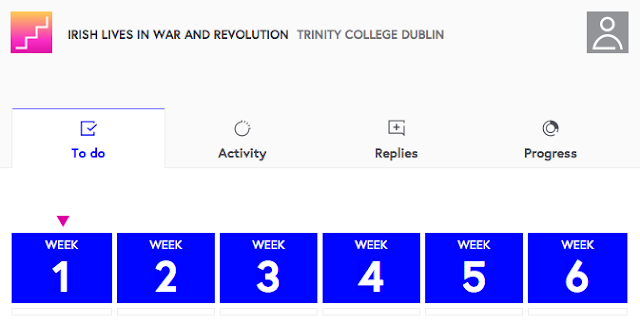 Irish Lives in War and Revolution: Exploring Ireland's History 1912-1923 is created by Trinity College Dublin and organised through FutureLearn. It runs for 6 weeks and you can join at any time but best to catch it right from the start. The period between 1912-1923 is characterised by 3 Wars and a Rising - the Great War, the Easter Rising, the Irish War of Independence and the Irish Civil War. Each of these events left a mark on the people who lived through them (our ancestors) and we are still trying to understand what happened and how it influenced who we are today. This course first ran last year and asks some pretty tough questions: How do people experience war and revolution? How does political change, violence, total war, affect life in its most basic ways? Looking at Ireland through war and revolution, this course considers these and other questions about Irish life between 1912 and 1923. The course looks beyond the familiar names and the famous faces – the traditional histories can tell us about them. Instead, it explores how the events that shaped the nature of modern Ireland were experienced by the people who lived through them or in spite of them. There will be a mixture of course material including review articles, videos, quizzes, discussion points, chat rooms, surveys, reflections from academics, and of course homework assignments! You are encouraged to spend a few hours each week on the course material.